May 14, 2018 6:00 P.M. Preview: Thursday, May 10th, 4:00 - 6:00 p.m. Removal: Wednesday, May 16th, 3:00 - 6:00 p.m. 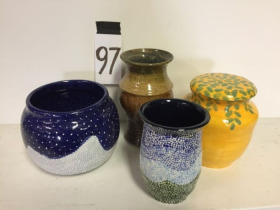 Preview: Thursday, May 10, 4:00 - 6:00 p.m.
Online bidding ends: Monday, May 14 starting at 6:00 p.m. 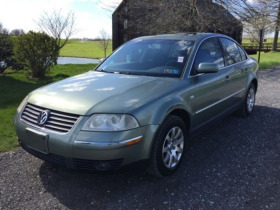 Removal: Wednesday, May 16, 3:00 - 6:00 p.m.
2002 Volkswagen Passat, 4 door, sunroof, 150,000 miles, great daily driver, plus a pair of snow tires. Inspected till Feb 2019. Camellia Garden 16” Porcelain Doll with Swarovski crystals in wood and glass case. Never used. Small wooden shadow box with lighter collection, Zippo, Continental, Evans, etc.,. Nice Kitty cookie or treat jar. Never used, 8 inches tall. 4 Leonard Pewter goblets (Japan), stoneware cups and saucers, French cow milk pitcher. Instant Bar! Margarita wine and parfait glasses. 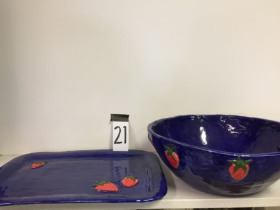 Handmade large bowl and platter, ceramic, blue with strawberries. Rust colored Camp Chair with navy colored sleeping bag. Timeless Treasures 16” porcelain doll. New in box. Timeless Treasures 16” porcelain doll. Catherine collection. New in box. Imusa Granite Mortar and Pestle, new in box. Rawlings Nolan Ryan baseball mitt, Easton stealth cather's mitt and one dozen baseballs. Igloo Ultra Cold 50 cooler, broken hinges, Coleman two burner camp stove in great condition. Hand blown glass, crystal and cobalt blue candlesticks, sherry glasses, Gorham crystal bowl, tall blue vase with detailed filigree. Unique Tetra fish bowl. Black ceramic cat cautiously watches over it, new with box. Vintage silver plate serving pieces. Add a little polish to your next event! Stack of games. Who Wants to Be a Millionaire, Imaginiff, Cathedral, Bop-it, and Belly dance kit. Antique wooden bed frame. Full sized. Tyler brand vintage bicycle, made in Poland, 3 speed. Murray brand Knight Shadow 10 speed mountain bike, needs seat. Free Spirit 15 speed touring bike with Onza handlebar pulls and working bell. Vintage Montgomery Ward coaster with handbrakes. Electric Lawn Mower, Task Force Brand, 12 Amp, 18”, 3-in-1 cutting, mulching and side discharging, with rear bagger. Assortment of Rubbermaid and Zip Lock brand plastic containers and lids. SpongeBob Galore! Alarm clock, blanket, playing cards, s of plushies. New kite, and more. Two antique single bed brass headboards. Two pairs of cross country skis. One Men's, boot size 9, one set of poles. Collection of plush toys, Disney, Hallmark, Winnie the Pooh, Build-A-Bear, Aurora, Star Wars . . . Antique wood service table with drop sides and enamel top. Cookie sheets, tray, 9 x 13 pan, frying pan, and pasta pot. Nine rolls copy paper, great for banners and drawing. Hold onto your seats! Original 1960 Studebaker hub caps, very rare, great condition. Vintage metal bamboo wall art. Youth futon/couch. Metal frame, dark grey cushions, adjustable sides. Metal frame collapsible butterfly chair, removable sky and clouds canvas cover. Five sets of ten each lighted paper lanterns, some need batteries. Sears Craftsman motorized scroll saw, vintage. Hums when turned on, but not operating. Skyline carry-on suitcase, travel bag Relic brand.  American Tourister carry-on suitcase, travel bag Relic brand. Huge frying pan and sauce pot, perfect for big gatherings. Burgundy floor pillow with matching sheer panels, cube bean bag and floor pillow. Patchwork fabric shower curtain with colorful ceramic ball rod hangers, down blanket, yellow twin eyelet comforter. Two dinner settings for two plus miscellaneous mugs. Antique stoneware crock, 5 gallon. Five classic games and Bop-It extreme. Three antique meat mallets. Wicker picnic basket and woven tray. Pair of gun-toting lawn gnomes in camo with red hats. Hand thrown pottery with lidded jar. White formica topped table, four metal and black damask fabric covered seats. 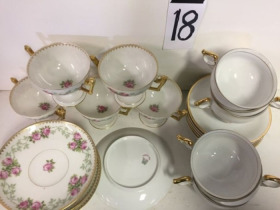 Very sturdy set in very good condition. 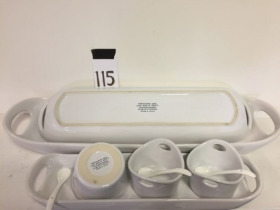 Panasonic “The Genius” Sensor 1250 inverter microwave oven, 1250 Watts, like new large capacity, with carousel feature. Party favors/gifts for kids, all new with tags. Two twin bed comforters, body pillow, blankets and a huge collection of plush collectibles. Four green damask throw pillows. Charter Club from Macy's. Unique Pittsburgh Iron Folding Bed Company, folding full sized bed springs. Pinterest has loads of creative bed spring ideas. Assorted small toys games, wooden pig piggy bank and plush animals. Plano tackle box, Master Sportsman new with tags fishing vest. 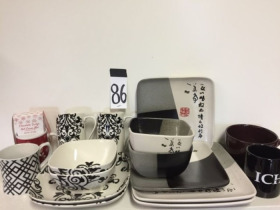 Large ceramic serving set. Three sizes. Three sauce bowls. Three spoons. Ranging from 16-24 inches long. Used once. Bin of office supplies, vintage revolving date counter and post office scale. Ceramic based table lamp, floral design. Rare five foot tall five drawer wooden filing cabinet. Nice antique with decorative brass drawer pulls. Large cobalt blue decorative bottle. Beautiful Red 24” Bamboo decorative platter on large plate stand. Insignia I-Pod dock and CD player with speakers and a remote control. Collectibles from around the world: Greece, Philippines, India, Japan, Mexico. Case of 18 matching wine glasses used once. Antique wooden ironing board with Black and Decker iron in box. Retro Lava Lamp, yellow and blue with metal base. Retro Lave Lamp, purple and blue with black metal vase. Halloween and dress up costumes. Halloween costumes and papier mache pumpkins. Three Native American Squaw costumes, 3 sets angel wings, Halloween accessories, fabric for costumes. Forty quart refrigerated electric cooler, Coleman Brand, model 5460. Runs from outlet or vehicle cigarette lighter. Small wooden antique rocker. Newer caned seat. Small crack on back of chair. Antique wood chair, woven cane seat, needs chair rung repairs. Two brown metal lamps, floor and desktop, crate included. Bissel Pro Lite Upright Vacuum and Dirt Devil Plus handheld vacuum. Baseball autographed by Pirate Bob Friend, (ink has bled into leather) and Pirates baseball cap. Baseball autographed by Pirate Bob Friend. Baseball autographed by Pirate Bob Robertson. Ladies hats, sombrero, magic hat, and woven grass hats. Cowboy hats and more. Costume/Halloween stuff. Vintage fireproof strongbox security chest with two original keys. Glasses, glasses, glasses. Sunglasses, prescription and readers. Christmas tins, hanging ornaments and Advent wreath candle holder. Zylux speaker system for Dell with Sub-Woofer and speakers, Linksus modem and satellite modem. Miscellaneous electronics. Troller brand Autopulse electric train transformer, and HD Scale train transformer, Sony voice recorder. Two Nylon sleeping bags. One green, one blue. Two vintage lamps, one without shade. Insignia CD Radio MP3 Player, Dell Photo964 printer, copier, scanner. Vintage green glass dish and abstract glass sculpture. Chords, computer memory, and ethernet chord. Three Steelers Caps, never worn, one with flaw on back. Gardeners corner, bulb planter, watering can. 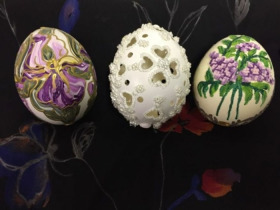 Beautiful handcrafted Eastern European Bridal eggs, for Bride, Mother of Bride, Maid of honor and bridesmaids. Large collection of lighters, Zippo, Colibri, cigarette advertising and novelty lighters from France. Old working drill, jigsaw and handsaw. Also flashlight and fireplace tools. Three new never worn Yuengling Beer T-Shirts, and three bonus Yuengling plastic cups. Watermelon slicer, pineapple slicer, wooden scoop, wooden drink coasters. Huge of plush animals, many new with tags in giant Ikea bag. Bentwood basket with office supplies inside, plus two new address books, plus book on making bentwood. Vintage perfume atomizer, zipper pull and rhinestone bracelet (missing one rhinestone). Assorted duffels, backpacks and totes. Vintage cast iron firehouse plaque. No marking on back. Wilton FS13 firehouse plaque, cast iron. Vintage bristle dartboard made in England. Assorted darts included. Moe's tavern magnetic children's dart board. Industrial style, jewelry case, mirrored with s of keychains and included jewelry. 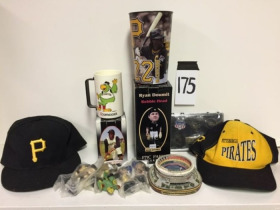 Old Pez Dispensers, Little Golden Books, and collectible windup coke bottle toy. Silver plated water pitcher, brass serving tray, copper watering can, two class candlestick hurricanes. Five Gallon antique stoneware crock with Horseshoe marking. Two one gallon stoneware crocks. 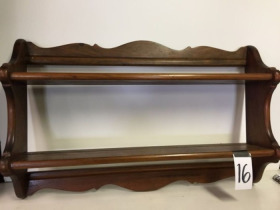 Old wooden wall shelf, tins, single rainbow maker in double rainbow maker box. Original watercolor by Tom Ross, Cottage by the Lake. Large assortment of stained glass manuals, magazines, and patterns. One Kg and two Kg medicine balls, very old badminton racquet. Bag of baseballs. Serrano Leather women's large red leather jacket, excellent condition. Claiborn men's black lambskin leather bomber jacket, size large, quilted inside, very good condition. Ann Taylor Loft black faux fur jacket. 10P Like new. Antique Roman Charioteer with horses. Constructed of metal. Excellent condition. Cameras. Minolta X370, 35 mm with zoom lens, Olympus FE-230, Olympus Accura Zoom 105, and waterproof disposable. Working condition unknown. Vintage Colonial Three legged stool, Early Colonial crafts, Marion Center PA, signed and dated 5-9-74 Tim Sherdle, plus bonus items. Finished edge area rug, 6'x8', square floral pattern, green, peach, beige. Extra piece included. Big stack of classic games. Brass planters, craft stuff, and misc. Misc. 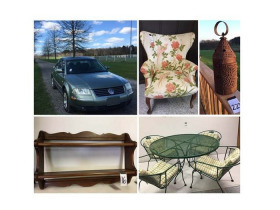 Jackets, men's sized 9 Nike tennis shoes, Magnavox CD Alarm Radio, and combo seat back stadium seats. Emergency Car kit, scraper, booklights, pens etc. Three very nice evening bags. Rain stick, umbrellas, fabric, shelf, Clairol curlers, freshwater pearl earring set and much more.